When my wife, Lynn, and I travel we always plan on visiting key gardens and major museums. 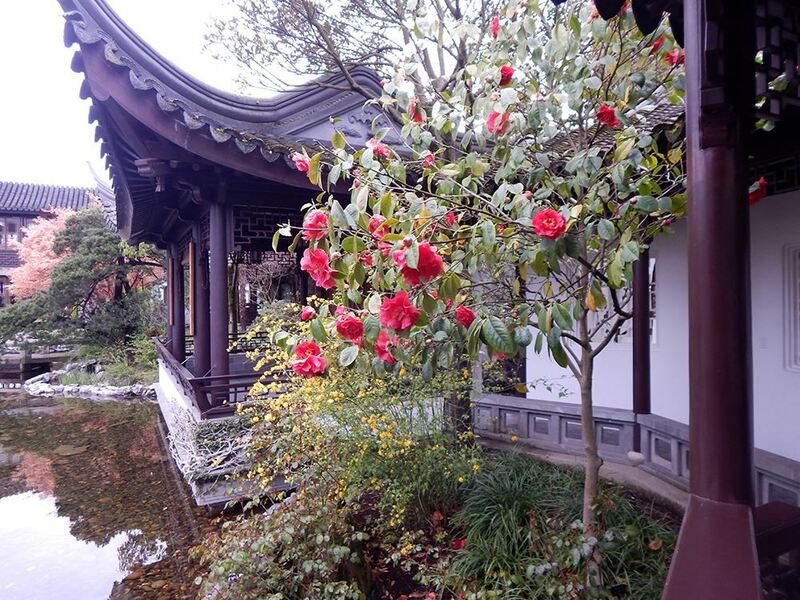 Therefore when visiting Portland, Oregon for a camellia show and an American Camellia Society meeting we were pleased the local host arranged a tour of Lan Su Chinese Garden. Our tour guide informed us that Lan Su Yuan means Garden of Awakening Orchids. 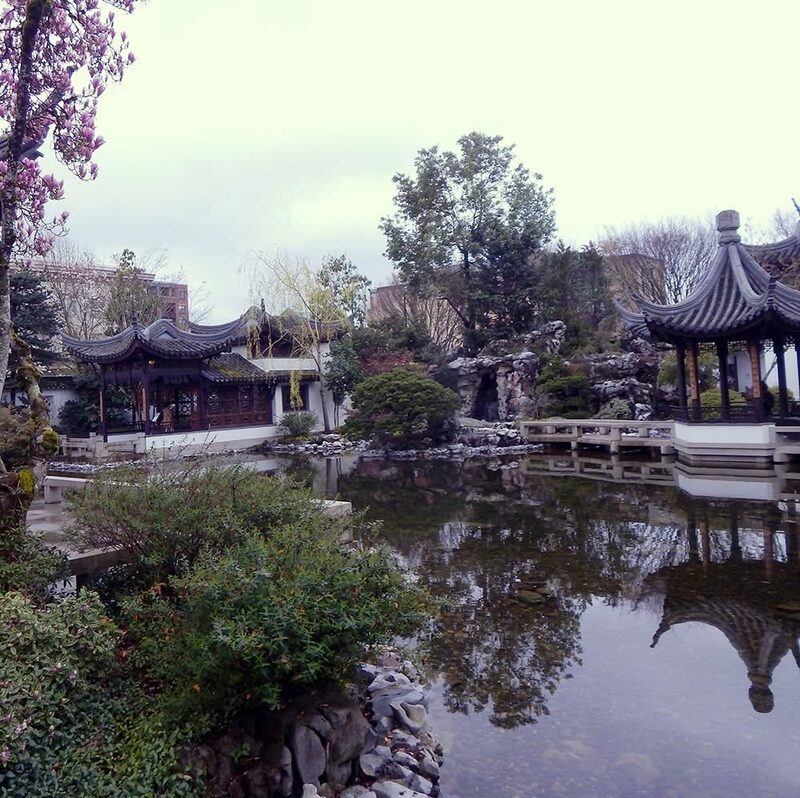 There are hundreds of plant species native to China throughout the garden, which is located in the middle of the city of Portland. The wall around the garden provides an oasis in this busy city. The garden features a pond, teahouse and sculptures. 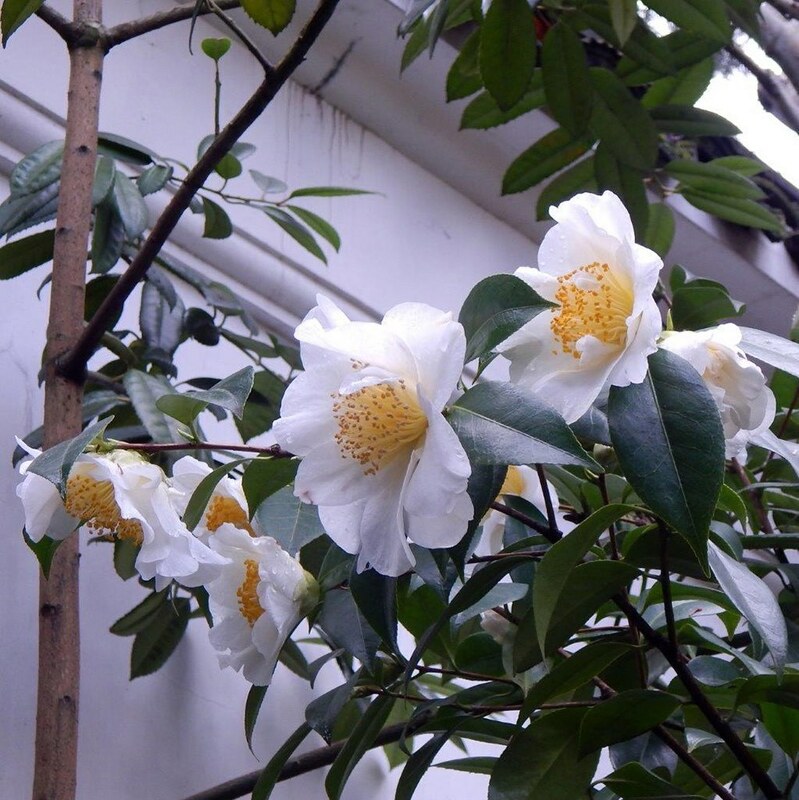 There are collections of magnolia, peony, rhododendrons, osmanthus, bamboo, and camellias, all Chinese natives. As a camellia enthusiast we were impressed with a large specimen of C. reticualta ‘Dr. Clifford Parks’ in full bloom. The red flowers are very large (over 5 inches) and are usually semi-double and occasionally anemone shaped. It was bred by Dr. Clifford Parks, a botanist at the Los Angles State and County Arboretum, before moving to the University North Carolina. It is a popular cultivar throughout the camellia growing world. It was introduced in 1971. Did you notice it is planted on a small island and how beautifully the plant frames the Chinese pagoda (see photo)? The miniature-to-small red C. japonica flower with a central mass of petaloids we call ‘Tinsie’ was imported to the USA from Japan in 1930. However it has been known since the Edo period in Japan as ‘Bokuhan’. We viewed it through a perfectly-placed irregular window in an interior wall making a wonderful frame for this bloom. This creative view is a traditional Chinese garden architecture design. As we strolled on the paths that circle the pond we enjoyed views of the sculptures, buildings, and plantings taking photos of each other and the garden features. 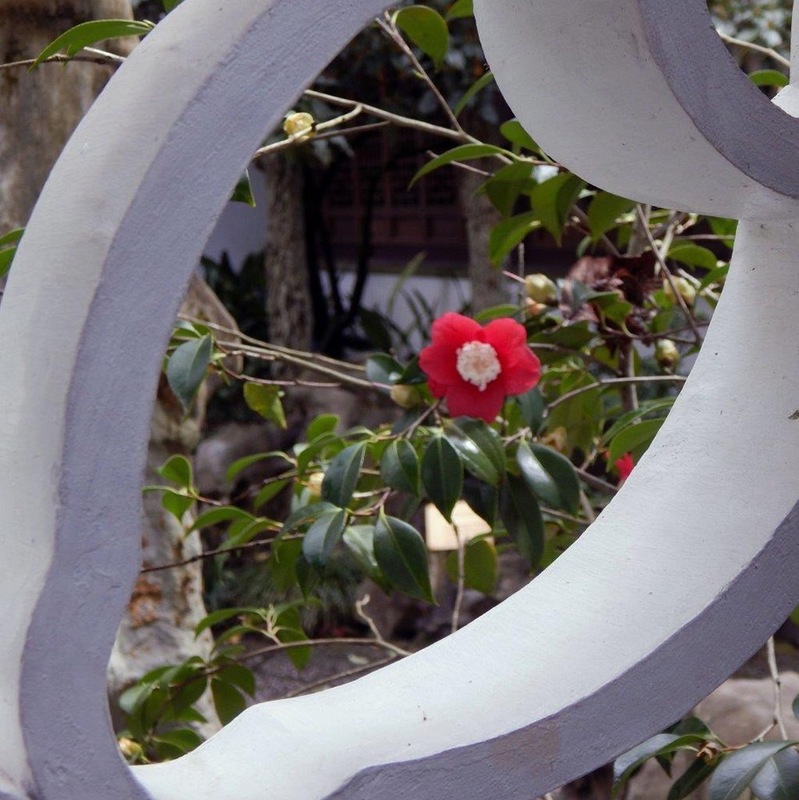 When we came across a very large white semi-double camellia in bloom that was not labeled; a cluster of American Camellia growers debated its identity. Don Bergamini, a past president of ACS, declared it was C. japonica ‘Silver Waves’. The flowers had the very large white semi-double blooms with wavy petals. In addition, it was growing vigorously in an upright manner, another characteristic of this variety. His claim made sense to me being familiar with this Nuccio’s Nurseries introduction. However, my technical mind wanted it confirmed by the garden botanist who was available to answer our questions. Kudos, Don, for your accurate identification, part of the fun of traveling with friends. This beautifully-designed garden is one to put on your bucket list for when you get to visit the attractive and vibrant city of Portland, Oregon, which by the way was named after Portland, Maine.